First grand duke of Russia (1169-74). He conquered Kiev after the death of Vladimir Monomakh (1169), but selected the northern city of Vladimir as the capital of the kingdom. At that time Kiev was an important commercial center with a considerable Jewish population, the Jews controlling the trade between western Europe and the Far East. 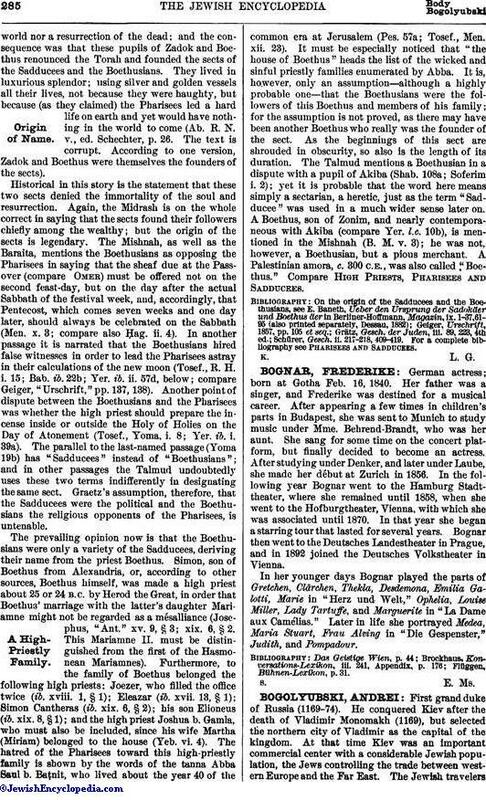 The Jewish travelersBenjamin of Tudela (1160-73) and Pethahiah of Regensburg (1175-85) visited the city. Admission to service in the prince's militia ("druzhina") of old Russia was not confined to any nationality or creed, and the soldiers enjoyed many liberties. Bogolyubski was the first Russian autocrat, and he curtailed many of these privileges of the druzhina. Besides this, Christianity had made considerable progress in Russia, so that the religious freedom of the militia was also attacked. Bogolyubski, who surrounded himself with foreigners from all countries, both Christian and non-Christian, took pride in showing them the splendid church of the Virgin in Vladimir, in order that those of a different religion might be attracted to the Greek Orthodox Church and be baptized. The chronicler of Kiev praises Bogolyubski especially for his Christian deeds and his conversion of many Bulgars and Jews. 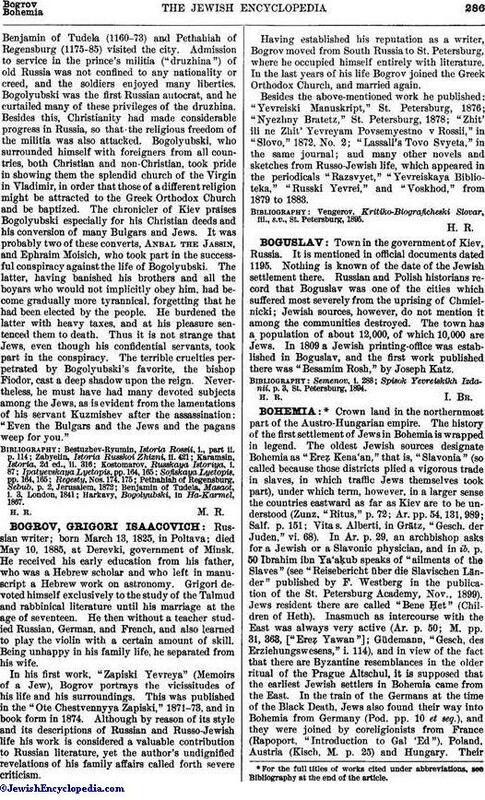 It was probably two of these converts, Anbal the Jassin, and Ephraim Moisich, who took part in the successful conspiracy against the life of Bogolyubski. The latter, having banished his brothers and all the boyars who would not implicitly obey him, had become gradually more tyrannical, forgetting that he had been elected by the people. He burdened the latter with heavy taxes, and at his pleasure sentenced them to death. Thus it is not strange that Jews, even though his confidential servants, took part in the conspiracy. The terrible cruelties perpetrated by Bogolyubski's favorite, the bishop Fiodor, cast a deep shadow upon the reign. Nevertheless, he must have had many devoted subjects among the Jews, as is evident from the lamentations of his servant Kuzmishev after the assassination: "Even the Bulgars and the Jews and the pagans weep for you." Harkavy, Bogolyubski, in Ha-Karmel, 1867.